Everyone who ever met George Worrilow liked him. As dean, he ruled the college with vision, compassion and a determination to make it the best agricultural school in the land. When he saw something that needed done or a teacher he thought would make a great addition to the faculty, Worrilow was a bulldog; he vigorously pursued his goal until he achieved it. As busy as his administrative schedule was, Worrilow still visited farmers throughout the state to check on how things were going in the field and learn what the college could do for them –a habit begun years before when he was a Delaware Cooperative Extension agricultural agent. Fortysome years ago, when the Ag Alumni Association discussed establishing a service to agriculture award, there was no doubt in anyone’s mind whose name it should bear — Dean George M. Worrilow. Worrilow’s entire career was dedicated to better agriculture and better agricultural education. 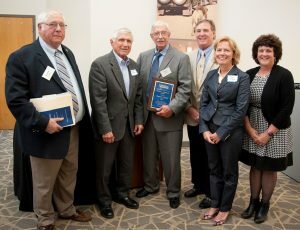 Named for a man whose belief in the art and business of agriculture and whose respect for the Delaware farmer were steadfast, the Worrilow Award is presented by the Ag Alumni Association each year to a graduate of the college who has exhibited outstanding service to agriculture. 2018 Worrilow Award Winner James Glancey (right) stands alongside CANR Distinguished Alumni Award winners on October 20, 2017. For the full story on the 2018 award and additional photos, click here and here. 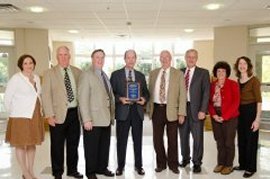 2017 Worrilow Award Winner Wayne Currey (third from left) displays his plaque alongside former Worrilow Award winners Keith Carlisle (1998), Carlton Fifer (2002), Ted Haas (2001), Robin Talley (2014), and Joanne Whalen (2011) on October 28, 2016. 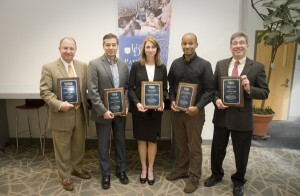 2016 Worrilow Award Winner Charles C. Allen III (left) displays his plaque alongside CANR Distinguished Alumni Award winners on November 6, 2015. For the full story on the 2016 award and additional photos, click here. 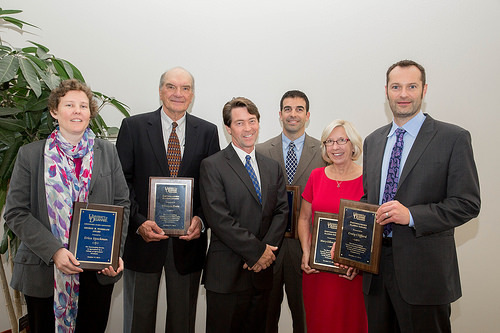 2015 Worrilow Award Winner Erica Spackman (left) displays her plaque alongside CANR Distinguished Alumni Award winners, including 1999 Worrilow Award Winner Thomas Fretz (second from left). 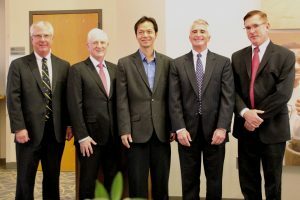 Joining them is CANR Dean Mark Rieger (third from left). For the full story on the 2015 award and additional photos, click here and here. 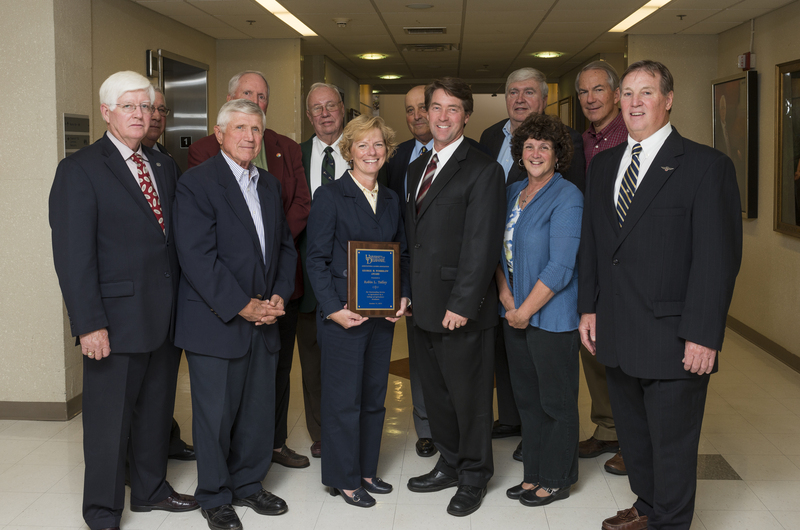 2014 Worrilow Award Winner Robin Talley (holding plaque) is flanked by CANR Distinguished Alumni Award winners as well as former Worrilow Award Winners. Joining them is CANR Dean Mark Rieger (to Talley’s left). For the full story on the 2014 award and additional photos, click here and here. 2013 Worrilow Award Winner Ronald Ritter (center) is flanked by former Worrilow Award Winners Spangler (Buzz) Klopp and Ted Haas (left) and Grove Miller, Jack Gelb, and Joanne Whalen (right). They are joined by current UD Ag Alumni Association President Jennifer Walls (far left) and current UD Ag Alumni Association Treasurer Maria Pautler. For the full story on the 2013 award, click here . 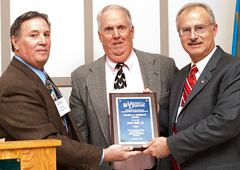 2012 Worrilow Award Winner Jack Gelb (right) with former Worrilow Award Winners Ted Haas (left) and Spangler (Buzz) Klopp. For the full story on the 2012 award, click here. 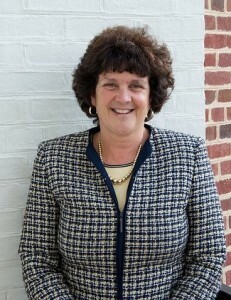 2011 Worrilow Award Winner Joanne Whalen. For the full story on the 2011 award, click here. I never met Professor Worrilow but I do know that one of George’s greatest accomplishments was raising his daughter. Miss Worrilow was my 4th grade teacher and I am still in awe of the great person, teacher and inspiration Miss Worrilow was for me. Thanks Professor and may God Bless you and your Loving Daughter!